This is a reflection piece on Typhoon Mangkhut written by Paul Arada, MEAL Specialist of TUKLAS Innovation Labs. I remember the day I was assigned as staff №5 in an international humanitarian organization’s Super Typhoon Haiyan (local name: Yolanda) rehabilitation response in Eastern Visayas back in 2013. It was July- nine months after the landfall. The community facilitators led me to desks covered with papers. When stacked together, the pile might as well be as tall as a toddler. A few weeks later, our Monitoring and Evaluation Unit introduced Poimapper, an Android-based data collection tool. It is similar to other open-sourced tools but relatively easier to use for a fee. Whether we liked how the app looked or felt, we had to use it. The headquarters had an organization-wide subscription. With Poimapper, beneficiary selection was cut down from a few weeks to a few days. Fast forward today, September 2018. I am with TUKLAS now, an initiative funded by the Department for International Development (DFID) and supported by Start and CDAC Networks. The project aims to identify and nurture community-based innovative solutions for disaster preparedness. Typhoon Mangkhut brought northern parts of Luzon in a state of calamity, specifically, Cagayan, Isabela, Abra, Benguet, Mayoyao in Ifugao, and the whole of Ilocos Norte*. I called Kei last Tuesday (11 September), the project manager of the TUKLAS Northern Luzon (NL) Lab to know how are the innovation teams and communities we support. The teams are fine, as assured by Kei. The NL team is also in constant contact with them. She also added that right after the onslaught of the Ompong, they started collating damage reports all over the regions. They are also aware that the areas hit are where their innovators and their partner communities reside. Kei shared this story about their two innovations teams from Ilocos, which joined forces to set up a soup kitchen in their areas. These are Tulong Kabataan (TK) Ilocos, who is working on a game app to raise awareness of the youth on disaster preparedness so it would translate to volunteer youth network; and Katinnulong Daguiti Umili iti Amianan or KADUAMI (People’s partner in Northern Luzon), who is working on a resilient shelter design inspired by the indigenous peoples knowledge on housing. QuikData, a disaster reporting app being developed by the Ilocos Center for Research, Empowerment, and Development (ICRED) and supported by TUKLAS, was put to a real-life scenario testing. It already had its previous testings — from simulations to post-southwest monsoon assessments last August 2018. The first version was once again put to test, this time, a damage needs assessment post-super typhoon. As per the innovation teams, there was a delay in the transmission of data, one and a half days to be exact, due to intermittent telco signal. Kei also shared this comic story from our innovators who are working on an innovative solution against camote (sweet potato) crop infestation, a considered agricultural disaster. The indigenous peoples in Ifugao noted that the camotes are sitting pretty underground, while their crops are weather-beaten. “[The community] Our innovators in the mining village of Loacan is the most heartbreaking situation. Loacan is in Itogon town, Benguet province. It is adjacent to Ucab village where the landslide occurred,” Kei noted. Almost every year, a landslide happens, she added. People are living in constant fear a landslide may happen at any moment. The land is hollowed out by the mining pits below the ground. The wettest months in Loacan and nearby areas are July to October. The grounds of the Cordillera mountain range has been saturated with constant rains since August. A landslide can happen at any moment. The people know. The government knows. Kei added that they did talk to the innovators and the communities about this. They can’t leave the area, they said. The land is where they rely on for a living. At the moment, the NL team is planning to invite the innovators with Loacan as partner community to be responders there as well. The TUKLAS Innovation Labs has closely monitored the storm and the situation on the ground together with its consortium members, Plan International Philippines, Action Against Hunger, CARE Philippines, and the Citizens’ Disaster Response Center. For the TUKLAS Northern Luzon Lab, all hands are on deck both on supporting the innovation teams and responding to community needs. Kei was in Laoag, Ilocos Norte when the typhoon hit. She hitched with CARE Philippines team from Laoag to Baguio in CARE’s pickup truck, together with her 15 y/o daughter in tow. The NL team’s community engagement officer (CEO), Amian hasn’t had any sleep since Thursday as he was busy collecting data from the Cordillera region. Another CE Officer, Uncle Pors, is the acting intelligence unit of their team. As a formerly active member of the farmers’ movement in the Cordilleras, he can tap these community-based organizations for information. May Wan, the MEAL Officer, and William, the Grants Officer, are in charge of procurement of relief materials. Kei is expecting that there will be delays in project implementation from the innovators as both the teams and the lab are currently occupied on relief efforts. I know that these experience are not comparable to my experience during Super Typhoon Haiyan response. But talking to Kei made me reflect on my experience then and now in TUKLAS. Since TUKLAS is supporting innovations, I came to remember some things which I deem “innovative” during the Super Typhoon Haiyan response. Do four walls make a house? Most of the time. We hiked a mountain and crossed a river and stumbled upon a family that lived in a teepee-style house. The pyramid-shaped house wasn’t his dream design but it was his way of making do of what was left from his old home. Instant food packs, just add hot water. 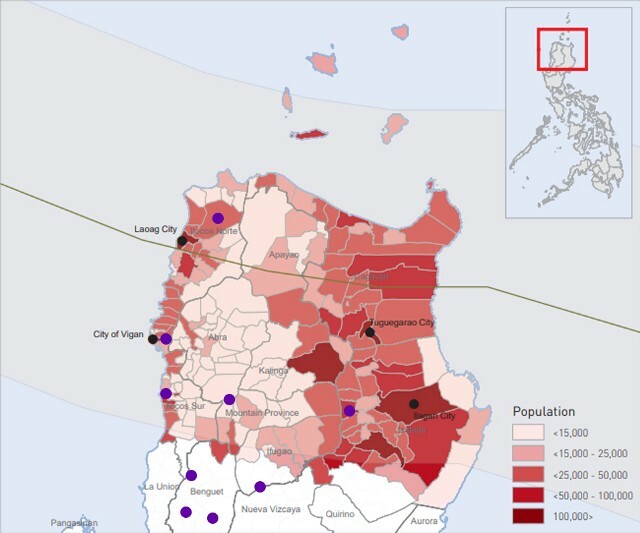 It was in Super Typhoon Haiyan response that microinsurance (MI) started to pick up momentum. Those few who availed of a disaster insurance received claims and those who did not have insurance were impressed and signed up for MI. There were nifty gadgets but never used in the operations. Later, I found them hidden in the storage in mint packaging. Community engagement through Feedback via SMS. Even if it was a manual setup, it was time- and cost-efficient both for field office and beneficiaries. To ensure our messages hit it home, we used the local language to bridge the language barrier. Super Typhoon Haiyan was a pivotal moment in the humanitarian sphere and in the communities’ lives. It was a massive mission where tiny tweaks can save time, resources, and lives. With this, the TUKLAS Innovations Labs recognizes that disaster situations are opportunities to brew innovations and that solutions for disaster preparedness which are developed and implemented with, by, and for the vulnerable communities would most likely be more effective and relevant. But the other side of the coin tells us that innovating with the community is not a stroll in the park. Communities innovate not mainly because of monetary returns but because doing so will directly affect their way of living. The only way an innovative solution would thrive is if the communities are onboard the innovative solutions- they believe it and they see its relevance. Back in Haiyan response, Poimapper was nice to have but as a field staff, it was a tool, up from headquarters down to the field. I felt like we were not given a choice to shop around for alternatives. In one word, top-down. Even though I’ve never seen how QuikData works, I am putting my hopes on it as it is locally-produced. Communities know the most what kind of information should be in the reports. They know what kind of information they can and cannot provide. This “feature” of being local is handy during times of disaster. The familiarity of a local app makes the community users more confident to use it. Instead of communities waiting for the enumerators to reach their area and collect data, they can report their situation on their own. This do-it-yourself feature seems empowering to me and it made for speedy data collection. This is why I compared the 1.5 days delay on QuikData versus the few weeks delay on Poimapper. And since the content of the report is ready to deploy, more time spent on data collection and less time on creating the questions (Like in Poimapper that you have to create the questions there). Emergencies are not the appropriate time to test out new tools and see if it works. But an app or any other solutions created and trusted by the community users is a clear winner over others that may have more features but has a slight learning curve. 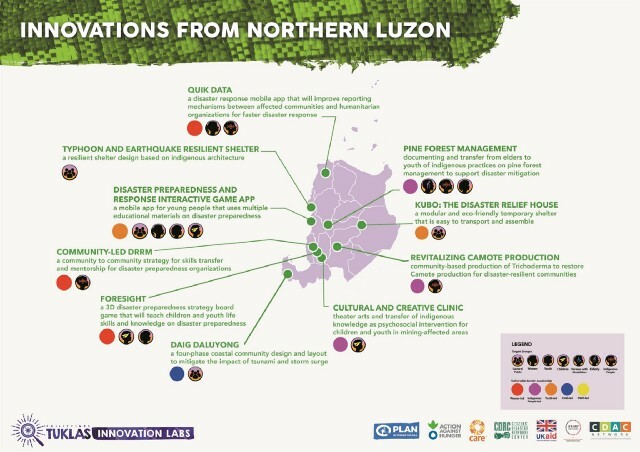 Map of innovations supported by TUKLAS Innovations Labs in Northern Luzon. Flashback on a Monday, 10 September, after Typhoon Mangkhut leaves the Philippine Area of Responsibility (PAR). This time, the landscape is in Makati City. My house is a 15-minute walk for me to reach our office. I checked social media while mail and other apps are loading. I was expecting the front page, but the truth is worth seeking. I typed #OmpongPH. Feed is filled with colors of the typhoon pallette — debris shades of brown, grey, wilted green with little specks of neon. Photos that looked like a huge chocolate stain on a green carpet caught my eye. There’s confetti of black dots and bright colors lower part of the photos. I let out a silent scream. I scrolled down to see more photos. I paused to let these sink in. I opened a database of people in the communities we cover. This spreadsheet belongs to the TUKLAS Northern Luzon (NL) Lab. That Monday was supposed to be the launch of our community engagement tool, an SMS hotline, in the Northern Luzon lab. The general task was to load their mobile number and first name into our SMS platform. So I matched the communities with the innovation control number and checked if I got the location right. My heart sank a little when the place names sounded familiar. Still feeling uneasy encoding names and places. My mind wanders and wonders…where are they now? Are they safe? Are they dry and warm? Do they have food? I closed the window to stop my overthinking. New mail. I get an assignment to talk to Kei. Ah, finally! Some news. I then finished the encoding. Hoping Kei says yes to a phone call.